Taxi Electric will be the first private taxi company to enjoy the new 100 percent electric Nissan e-NV200 taxi to its green-energy-fuelled, zero-emission fleet. The combination of Nissan's innovative zero-emission technology, in the form of the 100 percent electric Nissan LEAF and Taxi Electric's ground-breaking city transportation model have been a recipe for success since the start of operation in 2011. Now the two companies have teamed up again to build on this success and take the next step forward- introducing the game-changing all-electric Nissan e-NV200 taxi this summer. 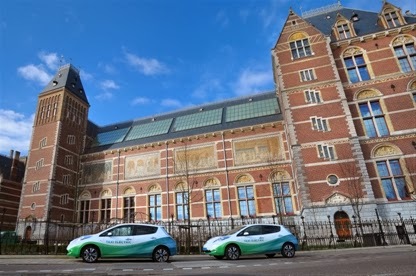 Taxi Electric, based in Amsterdam operate a fleet of 25 Nissan LEAF vehicles and were the first private taxi service to switch to a fleet of 100% electric taxis in November 2011. The Dutch company's fleet of Nissan LEAF's have now amassed a trouble-free 1.5 million km in taxi operations- clear proof of the electric vehicle's high quality and reliability. Andy Palmer, EVP Nissan said: "Taxi Electric was one of the first electric taxi companies in the world, and I've been impressed with their progress since their launch two years ago. They were the first to prove that zero-emission taxis - in the form of Nissan LEAFs - are a viable alternative. They have covered an astonishing distance in their fleet in such a short time and have shown just how reliable our electric technology is in a demanding environment. Their pioneering spirit closely matches ours and we are certain they will continue their success with the ground-breaking Nissan e-NV200." Ruud Zandvliet, founder of Taxi Electric added: "Two years ago we started with 10 Nissan LEAF. Each of these travelled well over 100,000 km and proved to be extremely reliable. Since last summer demand for our taxis is growing rapidly which allowed us to double our fleet. We are very excited about the e-NV200 as it is designed to be a taxi. This will improve our offering and open new business opportunities for us." Taxi Electric will not be alone in making the Nissan e-NV200 part of their taxi fleet, with the city of Barcelona having signed a memorandum of understanding with Nissan to promote it as a taxi for the Spanish region. 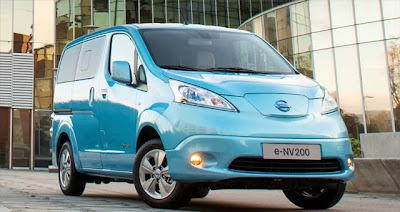 Global production of the Nissan e-NV200 begins in May this year, with sales starting in the summer.